Bought a few sizes up as I wear big touring style boots. They are simple to fit..however the soles are quite slippy, not dangerously slippy, bit enough that I needed to take care. Seem well made. Only 4 stars as I've not worn these yet in the rain. Not a bad compromise if like me you wear summer boots and just want a back-up in case your caught in rain. These are OK to carry around in case of emergency. However, there is no ventilation and they can make your feet get wet from condensation. Would better without the bottom soles. Bought size XXL to fit over size 11 boots. Worked well in heavy downpours during a wet week of touring. 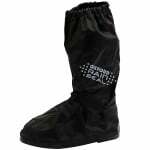 Well constructed product that kept my feet completely dry in over 200 miles of very wet weather. Easy to get on and off over my Sidi Vortice boots. Construction - sole is thin enough to feel what's going on and not interfere with the controls and the zip seems good quality. Does exactly what was promised. Great service and advice from Sportsbikeshop.